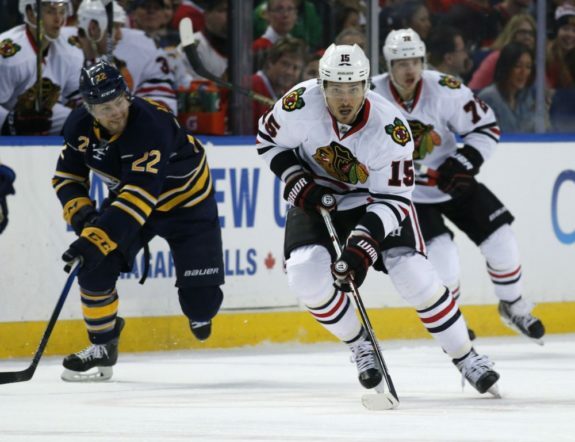 Summer Blockbuster on Tap for Blackhawks? The term blockbuster invokes thoughts of Star Wars, Titanic, Avatar and a now-defunct movie rental chain. Originally characterized by productions eliciting large audience responses, today blockbuster is more broadly used to describe high-cost or high-budget productions, sometimes irrespective of their success or popularity. That description seems apt for describing what may be on tap for the Chicago Blackhawks this summer. That is, trading a high-cost player from their roster to give the club flexibility in managing their salary cap position. Fueled by rumors that will stand or fall on their own, the concept has already created quite the response from the Blackhawks’ fan base who have taken to social media, working their way up and down Chicago’s roster debating who must stay and who is expendable. 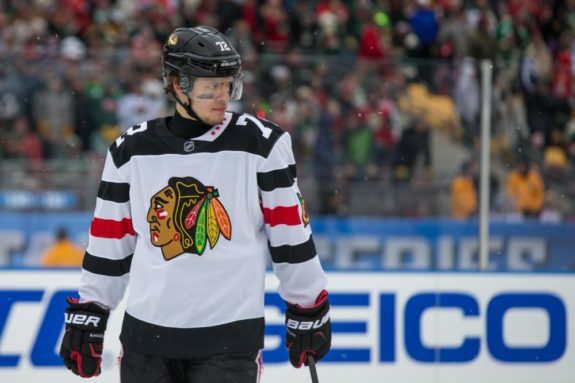 Let’s dig into the Blackhawks’ current roster situation and discuss who could potentially anchor a blockbuster trade for Chicago this summer. 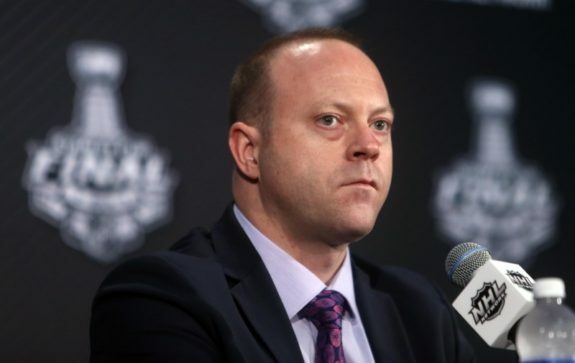 It has been communicated ad nauseam that the Blackhawks, without any increase to the League’s $73 million salary cap, are facing a cap overage of $4.5 million. Chicago is in salary cap jail, just waiting for the Vegas Golden Knights or other teams around the league to bail them out. Right? Perhaps, but it may not be as dire as some will have you believe. Each NHL team has a regular season roster comprised of no more than 23 players. The Blackhawks have 22 players on their 2017-18 NHL roster. That figure includes Marcus Kruger and Trevor van Riemsdyk but excludes Jan Rutta, Chicago’s newest addition. The roster is comprised of 13 forwards, seven defensemen and two goaltenders. So, how does that compare to the rest of the League? Acknowledging that changes will happen across the NHL prior to the start of next season, the Anaheim Ducks have a full, 23-man roster and $1.7 million in salary cap availability. Anaheim’s cap hit is the second highest behind Chicago. The remaining teams with the League’s top-10 priciest rosters have 17 to 22 players with cap availability between $2 million and $9.2 million. A complete look across the League (excluding Vegas) evidences that the Carolina Hurricanes hold the greatest salary cap flexibility ($27.4 million), while the Washington Capitals have the least amount of players signed for 2017-18 (11). Despite having to trim a bit of salary, the Blackhawks have a nearly-full roster. Outside of moving one or two contracts, the team could conceivably be ready to march into the 2017-18 season. That would be particularly true if we see the salary cap approach $76 million, near the high end of what is possible for next season. Can Subtle Moves Obtain Cap Compliance? In other words, can the Blackhawks get cap compliant without making a blockbuster trade? Let’s presume the much-discussed possibility of Kruger and van Riemsdyk to Vegas occurs. Assume one is taken in the expansion draft and the other traded, with compensation being minor (for example, a draft pick). That would drop the Blackhawks’ roster to 20 players with a total cap hit of $73.6 million. With cost-effectiveness in mind, Chicago could fill out their roster with cheap veterans or players on entry-level contracts. For the purpose of this exercise, assume that Tyler Motte (forward; $925,000 cap hit), Alex DeBrincat (forward; $778,333 cap hit) and Jan Rutta (defenseman; $925,000 cap hit) round out the Blackhawks’ 23-man roster heading into next season. That would result in a total cap hit of $76.2 million, a number that could theoretically make the Blackhawks cap compliant if the full five percent escalator is enacted. 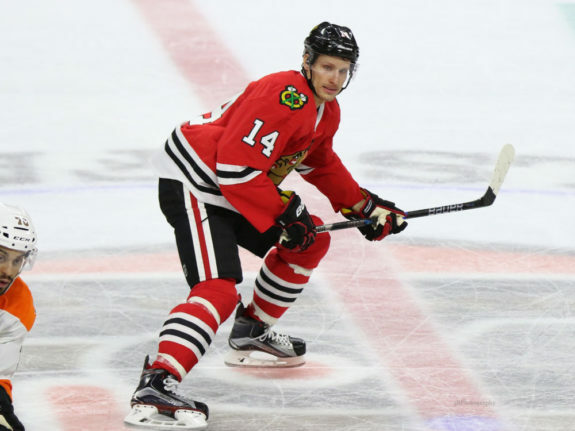 If general manager Stan Bowman and his staff wanted additional flexibility, they could also look to trade Richard Panik, who has a $2.8 million cap hit under his new contract. Re-signing a player like Dennis Rasmussen, Andrew Desjardins, Tomas Jurco or a comparably-paid player from elsewhere, would lower the team’s total cap hit by at least $1.8 million, bringing it down to $74.4 million or better. The conclusion? It is possible, especially with a sizable salary cap increase, that Chicago could manage their cap situation. But is it probable? No. Especially if the salary cap remains at or near $73 million, which recent reports seem to indicate. Additionally, such a strategy may not give the front office the roster composition they want nor give them much flexibility to make further roster adjustments. Since there seems to be some agreement that a top-six forward or top-three defenseman must be moved to ensure cap compliance and retool the roster, let’s consider the options. Speaking purely in terms of Chicago’s worst contract, Brent Seabrook’s has earned that distinction. He will be entering the second year of an eight-year contract, that carries an annual cap hit of $6.875 million, in 2017-18. Additionally, the contract has a no-movement clause (NMC) through 2021-22 and a modified no-trade clause (MNTC) during the contract’s final two years. Seabrook, at 32 years of age, will be 38 when his contract ends. Historically, very few players have been able to meaningfully contribute to championship-caliber teams at that age, let alone at the value of Seabrook’s contract. With that in mind, one could infer that the club should be reaping value from Seabrook during the early years of his contract. But, that was not evident in 2016-17. Statistically, while not a terrible year, Seabrook regressed on some fronts. His three regular season goals were the lowest in his 12-year career (including the lockout-shortened 2012-13 season). Further, Seabrook’s 21:54 of average ice time was his lowest since the 2007-08 season. His plus-5 mirrored some prior years but wasn’t his best given he’s hit double-digits in that category five times in his career. On the positive side, his 36 assists were his second-highest mark and his 39 points were better than his career average of 34. So, while I can’t imagine the Blackhawks want to lose Seabrook just yet, they can’t afford his contract. So, will Seabrook entertain waiving his no-movement clause and, if so, are there potential suitors that would be willing to take on his contract to bring his talent to their roster? At this stage of his career, it’d be hard to envision Seabrook waiving his NMC clause unless the potential suitor was ready to compete for a Stanley Cup. Given his Canadian roots (British Columbia), the Calgary Flames, Edmonton Oilers and Toronto Maple Leafs would all seem to make sense. A veteran like Seabrook could bring a real presence to any of those three teams as they look to take the next step. In the short term, all three of those teams could also handle the contract. Although, both Toronto and Edmonton will have to incur major costs to retain some of their young stars in the near future. The Vancouver Canucks could also make sense for Seabrook given the proximity to his home. But, given that they’re a team that looks to be heading towards/through a rebuild, it’s worth questioning whether that is a situation Seabrook would be willing to entertain. There’s little doubt the Blackhawks are exploring their options with but number seven holds the cards. 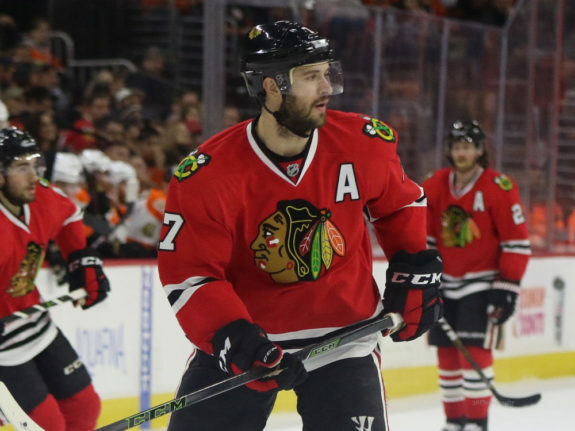 Anisimov might be a realistic answer to the Blackhawks’ cap situation. While he has been the benefactor of playing on a line with Patrick Kane and Artemi Panarin during much of his time with Chicago, his production has been consistent. Despite missing some games in each of the last two seasons, he’s tallied over 40 points each year, including at least 20 goals and 20 assists. Coupled with his production, Anisimov’s contract is movable. At 29-years-old, he’s entering the second year of a five-year deal. The contract carries an annual cap hit of $4.55 million. That’s palatable for a team looking for a second-line center that can provide the potential for 20-plus goals a year. Another key component of Anisimov’s contract is that his ability to restrict movement gradually dissipates. While the contract does have a NMC this season, that changes to a MNTC in 2018-19. The contract does not have any movement or trade clause in its last two years. Essentially, while Anisimov can block a trade in the near term, he will eventually be moved if that is the route Chicago wishes to pursue. Given Anisimov will gradually lose the ability to consent to a move or have input on a destination, it seems plausible that he would consider waiving his NMC if the Blackhawks can work out a deal with a team that he finds suitable. 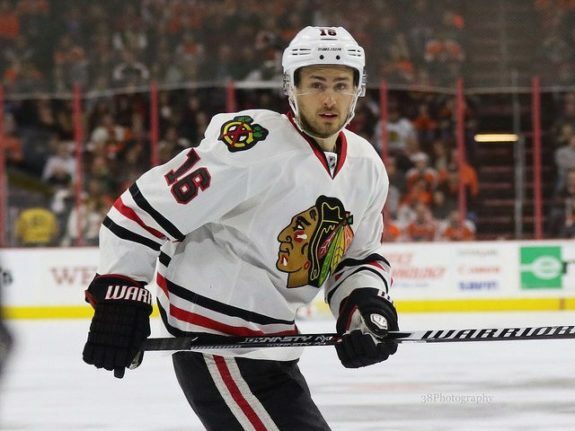 Trading Anisimov, along with the rumored Kruger move, could create a void at the center position. That’s something Bowman would have to consider. While both have been productive players, there is ample room to improve at center, especially in the face-off dot. Moving Anisimov and Kruger could give Bowman some latitude to reconstruct the position. Of the players that Chicago could realistically move, Panarin is the Blackhawks’ most valuable asset. He has ranked top-10 in scoring among NHL forwards over the past two seasons. His contract is team friendly relative to his production. Panarin is signed for two years at an annual cap hit of $6 million. For those players that finished with a point total equal to or greater to Panarin in 2016-17, only Nikita Kucherov and Blake Wheeler have more favorable cap hits heading into 2017-18 (excluding Leon Draisaitl, who is a restricted free agent). While Panarin’s regular season production would be hard to part with, he hasn’t proven himself to be the type of difference-maker needed in the postseason. For that reason, and depending on the return, trading him is worth considering. To do so, Bowman would have to seek a healthy return that would still yield a cost benefit. I’d expect one or two young, NHL-ready players to come back to Chicago in return. In addition, the Blackhawks would also need to consider receiving a draft pick or two as well. The addition of a couple of young players and the ability to restock some early-round 2018 draft picks is a good argument for moving the talented Russian. 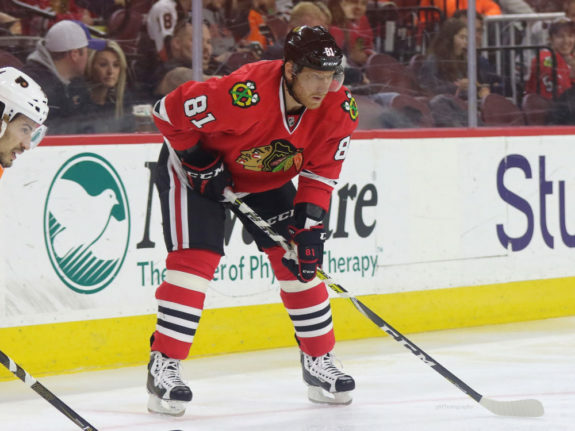 At first blush, trading Hossa makes a lot of sense for the Blackhawks. While still productive (he tallied 33 and 45 points in 2015-16 and 2016-17 respectively), he is on the 16th or 17th hole of his Hall-of-Fame career. Outside of the lockout-shortened 2012-13 season, those point totals are the lowest Hossa has produced since his second year in the League (1998-99 with the Ottawa Senators). Similarly, Hossa’s 2016-17 average ice time of 16:51 was also his lowest since the 1998-99 season. At 38-years-old, father time is gradually taking hold. In addition to a NMC, one other consideration relative to Hossa’s contract is what the collective bargaining agreement (CBA) calls the cap advantage recapture. Simply put, if Hossa were to defunct or retire before playing out the duration of his contract, the Blackhawks would be stuck with a $4.275 million cap penalty for each year that wasn’t played. This would hold true whether Hossa were to retire with Chicago or after a trade to another team. As Hossa’s contract nears completion, perhaps long-term injured reserve (LTIR) could also play a factor. Teams can place players on LTIR, continue to pay their salary (in this case only $1 million annually for Hossa) and eliminate the cap hit. However, unless Hossa were to actually be injured and wasn’t effectively retired, it would be interesting to see how the NHL would handle such a situation that could be viewed as circumventing the CBA structure. Overall, despite the benefits that a Hossa trade could provide for Chicago if he would be willing to waive his NMC and play out the duration of his contract, the combination of those elements make it unlikely that the Blackhawks will be able to successfully execute a trade. At the end of the day, there is a lot of uncertainty around how the Blackhawks’ summer will play out. That being said, given their combination of value and contractual considerations, I would handicap Anisimov and Panarin as the favorites to move. A domino has to fall. We’re just waiting on which one that will be.